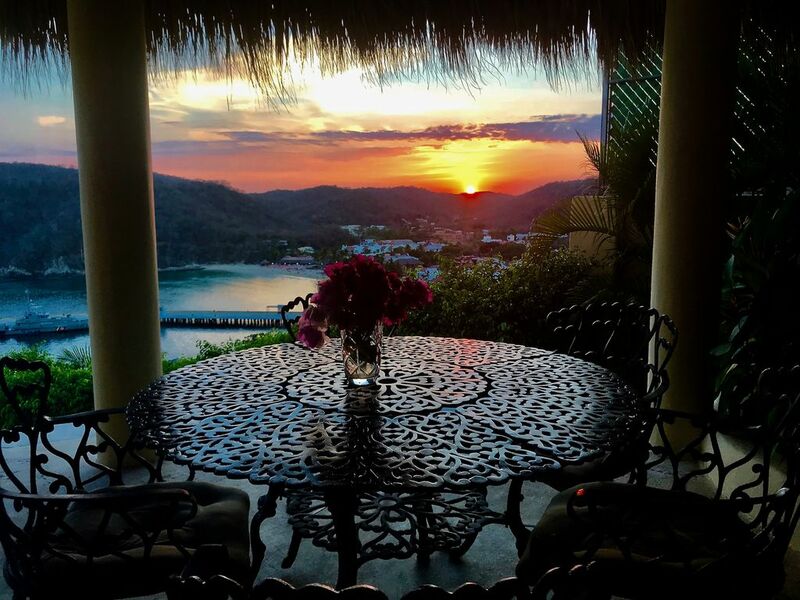 Villa Tres Hermanas (Three Sisters) is a luxury, oceanfront villa on a bluff overlooking the beautiful bay of Santa Cruz on the Pacific Ocean in Mexico's newest eco-tourist resort town of Huatulco. The Villa offers breathtaking views of the Pacific Ocean and the bay, marina, and village of Santa Cruz. Huatulco (wah-tool-co) comprises seven bays and 37 pristine beaches of golden sand, palm trees, and crystal-clear water. Enjoy sailing, boating, deep-sea fishing, snorkeling, scuba diving, kayaking, whitewater rafting, horseback riding, golf, tennis, and exploring the natural beauty of the bays. Villa Tres Hermanas is one of two villas and eight condos in a private, small village called Sueño Real (Royal/Real Dream). The Villa combines native marble, wood, and palapas with design features of Santa Fe and Greek Island architecture. Cantera fountains, palm trees, and a large infinity pool beckon you to take in the spectacular view of the Pacific Ocean and Sierra Madre Mountains. This two-story Villa features two private patios, a large palapa-covered terrace with lighted wet bar, all marble interior floors, all marble bathrooms, a cantera fountain, and comfortable, quality furnishings. The first floor has a living room, which opens on to the terrace and swimming pool; dining room; and full-size, fully eqipped kitchen with breakfast bar. This spacious villa (2000 square feet) includes three large bedrooms, each with super comfortable king-size bed and large private bathroom. The downstairs also includes a small study and a sofabed, a satellite TV, and high-speed cable internet. It is a non-smoking villa. Villa Tres Hermanas is within ten minutes walking to the beaches in Santa Cruz and Chahue, and a five to ten minute taxi ride to the unspoiled beaches of Tangolunda, Chahue, El Maguey, Conejos, and La Entrega. It is equally close to the restaurants, plazas, shops, and markets of the picturesque towns of Santa Cruz and La Crucecita. And it is only a 20-25 minute taxi ride from Huatulco International Airport in Oaxaca. Villa Tres Hermanas is managed by a professional staff (English and Spanish) who will provide you with information and friendly service to make your stay a truly carefree and restful vacation. Chef also available, upon request. We named Villa Tres Hermanas (Villa "Three Sisters") in honor of our three daughters. We spent summer and winter holidays there together. We still enjoy our vacations together in our second home and welcome you to be guest in our home in Huatulco. We are from Austin, Texas, and have spent many years vacationing in Mexico. We first visited Huatulco in 1999 and purchased the villa a year later. It was designed and built by a German architect who lives in Huatulco with his Mexican wife and children. He sought to combine Greek Island architecture with New Mexican adobe architectural forms. I think you'll agree that the villa captures the beauty of these classic Spanish and Greek Mediterranean styles. The spacious ocean front living room with marble floors is one of the places to do yoga in the early mornings, to meditate, and dance late at night----or on the terrace that is covered with a rounded palapa. In fact, there are so many places to get away on this property to meditate, swing in a hammock (three different areas), to read, to sit or work privately and there are beautiful communal areas too. Variety of lighting fixtures allow for the perfect ambience, as well as twinkling lights from the anchored boats in the bay and marina, candles on the tables from the Santa Cruz beach dining guests, as well as star and moon light. We have just arrived home from a two week stay at Tres Hermanas. It was a wonderful holiday. Cecilia and her staff were amazing. Always pleasant and eager to help. The villa is very well equipped and the private pool was amazing. Beds were very comfortable. Nice quiet area and yet so close to everything. We had a wonderful experience at Tres Hermanas. The private pool was the perfect temperature and it was so enjoyable to swim and look out on the ocean. The location is perfect with easy access to restaurants and beaches. The staff at Sueno Real were always so helpful and friendly. We are already planning our trip back. You are so welcome back anytime! It was a pleasure having you as our guests. Hope you have a blessed holiday season and may the new year be filled with health, joy, and peace. Words cant describe how great this home is. From the inside out, its an amazing home. Plus it has one of the best views! The staff that takes care of the maintenance is great and the owner of the property is very helpful and nice. We would stay here any time over Secrets Resort! Everything was absolutely flawless, stunning, and just overall perfect. Cecilia is just fantastic! Incredibly reliable, friendly, prompt, anything! For the first time I'm sad to be back from vacation! Arturo was the very best tour guide and so reliable! Between the two, you become friends with the whole community and you always feel comfortable and safe. Beautiful villa, fabulous weather, great beaches, lovely people, delicious food, totally fun !!!! The villa was amazing for 6 amigas celebrating special birthdays. The large bedrooms and private bathrooms provided us all lots of room and privacy. Having our own pool was perfect as the weather was hot and sunny every day. Everyone at the complex was so helpful with anything we needed. Taxis were cheap so it was very easy to get around. Restaurants and food were wonderful. This was definitely a vacation we will all remember !! Thanks to Angela (the owner) for making this so easy for us. Also a special thanks to those at the complex for all your assistance and to Ramon for bringing us fresh coconuts on his day off!!! We had a great time ! We enjoyed having you and you are welcome back anytime! The villa and compound are beautiful with a stunning view of the Sta Cruz Bay. The private pool is big enough to play and swim in. The house is decorated in a very elegant style, and is very well equipped to cook, live and relax. The staff is very helpful and make one feel very safe and cared for in the compound. We congratulate Angela and family for having such a nice place and are happy that we could stay there. We really love the Villa Tres Hermanas and Sueño Real complex.